The Happy Teen card is the gift that will send them over the moon! Favorite teen and young adult brands come together for a gift that's always hip - a gift card that lets THEM choose! Whether it's catching a blockbuster at Regal Cinemas or having a blast at Dave & Buster’s, the Happy Teen card is sure to help them make the best of memories with their friends. 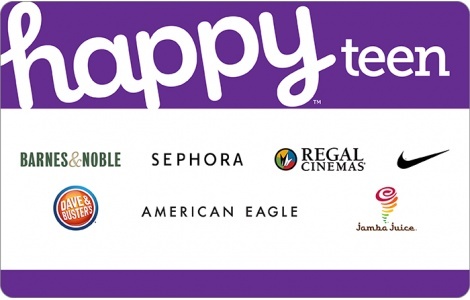 The Happy Teen gift card also lets them shop for the newest trends at Nike and American Eagle, unwind with a book at Barnes & Noble or get party ready with the newest cosmetics at Sephora. And what teen doesn't love a refreshing smoothie from Jamba Juice!